We collected the van and everything had been fixed, hooray! 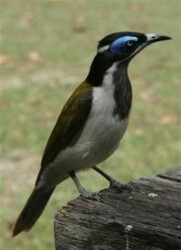 Off to Woody Head in Bunjalung National Park. 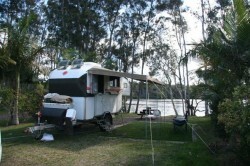 A great camping area near to Iluka, which is on the Clarence River. We stayed there for 5 days but, unfortunately the weather was bad with either clouds or rain, so we had to move on to recharge our batteries, the caravans batteries that is! The saucer sized huntsman on the window of the caravan on the last day had nothing to do with it! The camping area is a wonderful grassed area with lots of trees as in the photo below; and they supply firewood and fireplaces. 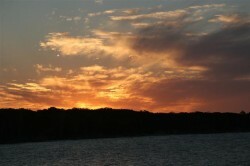 We enjoyed a final evening meal on the shore of the camping area watching a wonderful sunset. 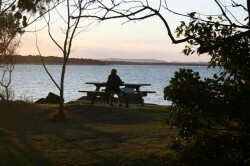 Bunjalung National Park has several picnic areas near the beach and we used these each day for lunch. 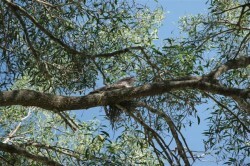 At the Shark Bay picnic area we met a new Magnoman and enjoyed the many birds that were in the trees and on our table. Fraser Reef picnic area was another one we enjoyed and Marg spotted something in the tree above the table while we ate lunch. See if you can spot it. A short walk to the beach after lunch was well worth the effort. 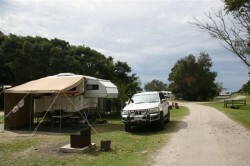 So off to Wooli, a small village on the coast, east of Grafton. 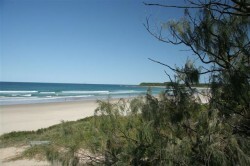 Wooli is surrounded by Yuraygir National Park so we will spend some time exporing there again. Our camping site is right on the banks of the Wooli Wooli river which is so clean that the oysters grown here can be sent to market straight after harvest, they don’t need purging in clean water. We liked the place so much we have booked in for a week. Yesterday we spent a few hours listening to the political machinations from Canberra and celebrated the result, a female PM elected in her own right, well almost anyway. 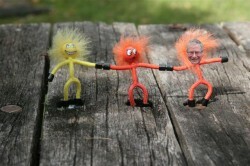 The sour lemon faces on the likes of Tony Abbot and Julie Bishop made the day that much more enjoyable. Conservatives seem to think that they have a birthright to rule, and any other situation is an aberration at best. However, I think Labor must use this term to improve their performance in delivering programs, and if they don’t they deserve to go. Enough of the political stuff. Marg is fishing on the bank of the river behind our camp at the moment, after a morning of cleaning ourselves and the van. I haven’t heard any screams of delight yet, so I presume she hasn’t been lucky yet, fishing that is! Off to the pub tonight for dinner, it is a $10 per meal night tonight!